While it is now widely acknowledged that environmental change, including climate change, could severely undermine security in the developing world, the implications for the developed world are just starting to be discussed. A sort of “developed-country complacency syndrome” has led many to assume that the main security problems for a country like the United States, such as waves of refugees or the need to intervene when other nations face disasters or conflicts, would be imported from abroad. Unfortunately, the United States is likely to face some fairly severe “Made in the USA” problems, as well. For instance, as the economic stimulus package is rolled out, the United States is entering a historic period of new infrastructure construction. From a security perspective, this could help maintain stability, or it could be a disaster. What might make the difference is assessing how potential sites could be affected by environmental change. Transportation systems, defensive capabilities, agriculture, power generation, water supply, and more are all designed for the specific parameters of their physical environments—or, more often, the physical environments of the Victorian, Depression-era, or post-WWII periods in which they were originally built. That is why unplanned environmental change almost always has negative impacts. In the case of a change in precipitation patterns, for example, drainage systems, reservoirs, and hydrological installations can all fail not because they were poorly engineered, but because they were engineered for different conditions. We are literally not designed for environmental change. Current environmental impact assessments look almost exclusively at a structure’s impact on the environment. These assessments must now be expanded to include the other half of the equation: the impact of a changing environment on the structure. These sorts of “dual” assessments are essential. To put it bluntly, there is no point in building a zero-emissions house in a current or soon-to-be flood zone. However, this is exactly the sort of thing that is being proposed in areas of the U.S. Gulf Coast. We can avoid this by requiring these “dual” assessments when applying for insurance, planning permission, and/or government support. Just as physical infrastructure is poorly prepared to deal with environmental change, so, too, is legal infrastructure. Very few regulations, international laws, and subsidies incorporate the effects of environmental change. At best, this renders them inadequate; at worst, it can create new vulnerabilities. For instance, the U.S. government’s National Flood Insurance Program (NFIP) can inadvertently contribute to putting people and infrastructure in harm’s way. When private insurers deem areas too risky to be eligible for coverage, the NFIP can step in and insure them, making it possible to build in areas that are current flood zones, as well as areas that may become ones as climate change causes sea levels to rise and storm surges to increase. Already in some areas the same homes have had to be rebuilt multiple times, in part with cash infusions from the NFIP. Water-sharing agreements, especially those based on a set amount of water, rather than percentage of actual flow, will become problematic as water levels alter dramatically. Fisheries-sharing agreements will be thrown into chaos as fish shift to other regions due to climate change and overfishing. Hydropower-sharing agreements will be a major problem, both for precipitation-fed systems and glacier regions, where there will be above-average flows as the glaciers melt, followed by droughts once the glaciers disappear. Legislation, agreements, and subsidies that do not account for environmental change can create artificial and unnecessary vulnerabilities at a time when the world is facing real physical challenges. It is imperative to assess existing and new legal frameworks in order to determine whether they create strengths or vulnerabilities. If they are found to create vulnerabilities, they must be adapted or abandoned. Two of the things the developed world prides itself on—its physical and legal infrastructures—are both highly vulnerable to environmental change. However, the stimulus packages and the reassessment of global, regional, and national agreements caused by the financial crisis offer a valuable opportunity to ensure that the structures and mechanisms we are counting on to maintain our security do not end up undermining it. Photo: Members of the Coast Guard Sector Ohio Valley Disaster Response Team and the Miami-Dade Urban Search and Rescue Team mark a house to show it has been searched for survivors of Hurricane Katrina. Hurricane Katrina, which devastated the U.S. Gulf Coast in 2005, revealed the vulnerability of U.S. infrastructure to natural disasters. Climate change could make hurricanes and other natural disasters more frequent and severe. Photo courtesy of Flickr user Tidewater Muse and Petty Officer Robert M. Reed. Cleo Paskal is an associate fellow in Chatham House’s Energy, Environment, and Development Programme. She is the author of UK National Security and Environmental Change. Mind blowing! Cant wait for you book to come out. There is a big empty space on the bookshelf about this topic. As a future officer in the U.S. Army, I am inclined to think about how the Army may contribute to combating the impacts of environmental change on America. I agree with the "dual assessment" you promote, but I believe this type of thinking should extend to military planning. On the home front the U.S. military has traditionally been called upon to aid in major environmental disasters, but the forces sent to mitigate damages haven’t always been properly equipped and trained. In 1927, the Mississippi River experienced a massive flood of which Herbert Hoover remarked, “It is the greatest peace-time disaster in our history (Simpich, 245).” Seven states in the Mississippi River basin were partially submerged, and 800,000 people were forced to relocate (Simpich, 244). Since the U.S. military lacked the proper amount of ships, more “than 1,000 vessels and ships were drafted into service.” Naval and Marine planes were sent to fly above the floods to spot victims, and the Coast Guard would in turn rescue them (Simpich, 273). The military was not ready for such an unprecedented disaster, and even today it is not totally prepared for these situations. 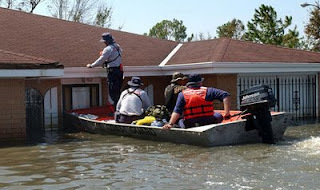 On September 3, 2005, the Army’s 82nd Airborne Division deployed to New Orleans during the catastrophe of Hurricane Katrina, but not in their usual method. Instead of parachuting into combat and fighting a hostile enemy, they used boats to perform search and rescue missions, where airborne training and rifle marksmanship was of little to no use. They arrived three days after the levees broke with just four boats at their disposal before Navy, Coast Guard, and Marine assets joined in (Gillmore). The Division commander, Major General William B. Caldwell IV, said “We eventually became the 82nd Waterborne Division and that really was our forte (Gillmore),” in response to their unexpected mission. The Mississippi River Flood of 1927 and Hurricane Katrina were extremely focused disasters relative to the expanse of the nation’s fifty states. I believe higher global temperatures will increase the destructiveness of hurricanes, and I do believe glacier-melt and sea-level rise will occur. This would mean that entire coastlines and rivers and tributaries, not only the Gulf Coast region, will become vulnerable to environmental disasters. Now the question is whether our military will increase the scope of their training to include measures to salvage America from environmental chaos; if that goal is too lofty, will our military, which has faithfully defended our freedom for centuries, possess the pure manpower and available resources to handle mitigation missions on a national scale? Central Intelligence Agency (CIA). The World Factbook: Afghanistan. Last Updated 30 November 2009. Gillmore, Gerry J. “82nd Airborne Division Becomes ‘Waterborne’ in New Orleans.” 21 September 2005. United States Department of Defense: American Forces Press Service. 6 December 2009. Simpich, Frederick. “The Great Mississippi Flood of 1927.” The National Geographic Magazine. (1927): Pp. 243-289. Ernie raises some really important points. As Ernie mentions, appropriate training and equipping are separate and equally important issues. I wonder if it might make sense to train and equip a portion of the National Guard specifically to handle natural disaster. These men and women would not be deployed overseas and could form the core of a permanent home guard designed to handle domestic civilian populations in crisis. The promise of no foreign postings may result is easier recruitment. As the majority would be reservists, their part-time employment may make it more financially viable. They would also have to be able to coordinate and integrate with other branches of the military when supplemental assistance is required. Perhaps military experts (Ernie?) can comment on if this is viable and/or anything close to sufficient. Or perhaps propose other structures that may help in what may soon become "interesting times".